Company of Heroes 2 game - a real-time strategy about World War II - today will get two new updates. The first one will include two maps and will be free for all fans, and the second add-on will consist of 10 new scenarios for your comprehensive and exciting battles. 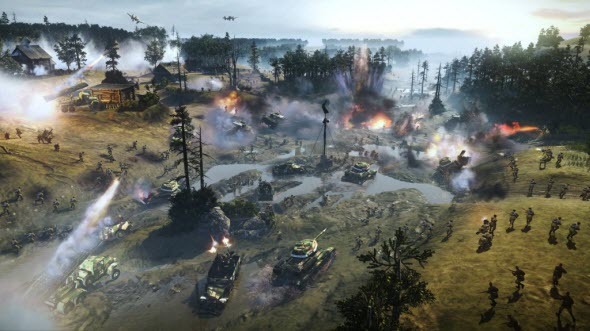 Free content for Company of Heroes 2 will bring brand-new multiplayer maps - Hill 331 and Don River. Also the developers have promised to make several improvements and to fix numerous game's bugs. The third thing that will be free for the gamers touches Steam Workshop integration. The second update is the full-fledged pack named Southern Fronts. It will bring 10 interesting campaigns that haven't been presented in the game yet. Almost all of them describe the Ukrainian war zone in 1943. It is interesting that here you will be able to take command of both sides - German or Soviet Armies. But the main feature of Southern Fronts DLC is rasputitsa. This a little bit strange term means a muddy season in Eastern Europe, during which it is very difficult to travel by roads. Of course, German vehicles were not intended for such weather, so the Soviet Union had a little advantage. However, for Russian tanks this situation on roads is also rather complicated, so on both sides the game will be challenging. Company of Heroes 2 DLC costs $4.99 and is already available on Steam. Moreover, now you can buy with a 10% discount. Don't miss your chance!